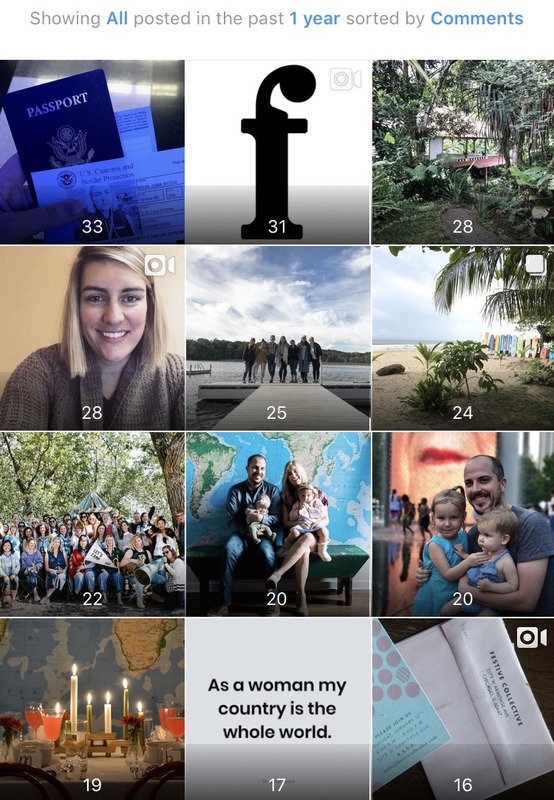 Last year I did my first blog post on Instagram Business year in review. Although I’ve taken a break from Instagram the last two months it’s still kind of fun no? The backend has changed dramatically. See last years post to compare the insane amount of options and navigation there are now! Let's Camp 2017 content was the winner last year and is the winner again this year in 2018. 3 quotes made the cut. That “Thinking of You” illustration by Mari Andrew on Mother’s Day was timely, I said I would try to do more of that after the popularity of the glossier post but I didn’t. Honestly it feels too hard. Reach - The number of unique accounts that have seen any of your posts (only counting the account, not the views). Again, the winning post was from the retreat weekend (read posts on that here and here). Pretty much the same as above except for 4 quotes instead of 3 and a shakeface video :). Engagement - The number of times your post was linked, saved, and commented on. The day we moved from Chicago makes sense that it has the most engagement. I believe the fastest way we're going to take down the patriarchy is by empowering ourselves through entrepreneurship. Let's reclaim how we spend our time, our growth potential, our pay. For now and the foreseeable future, we live in a society where "money is power" and "money talks" and it's the only voice the patriarchy listens to. #IMHO So start your business, grow your business, and let's take down the patriarchy together. That “women” pie is amazing. One new quote here and that hat! 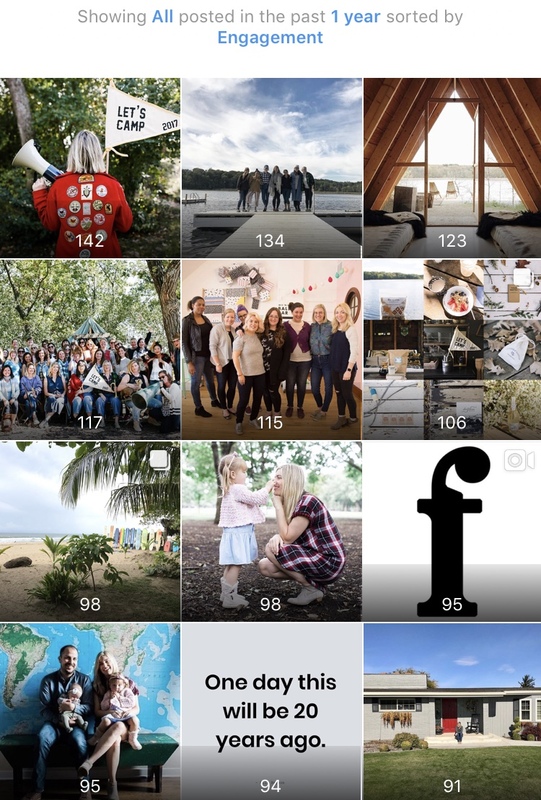 Saved - The number of unique accounts that saved your posts. This was the first full year that they had the saved function. I rarely ever use it and even if I do I rarely go back to it, but apparently other people use it all the time. Especially for quotes! I find it fascinating that people will save a post but not like it or comment on it. This function almost feels like the most “telling” to me on what people value and want to remember from your content. This is really interesting information but I don’t quite know what to make of it yet. Profile Visits vs Website Clicks are really interesting. All those website clicks are when I had a very clear CTA to sign up for something or read a blog post. Follows I don’t quite know what to make of. What’s the path? They got to my page from my post somehow and then followed me? Or they scrolled through my page clicked on some posts and then followed me and whatever post they were on that they hit “followed” was how the insight was calculated? Unsure. Post timing, like the Glossier #bodyhero campaign and Mother’s Day is great, but I can’t promise myself I’ll actually be good at doing anything about it. Ultimately I want people going to my website, so even if a post doesn’t have high engagement, if it has a high website click, that’s all I care about. What's working for you in your insights? Anything that surprises you? Would love to hear! 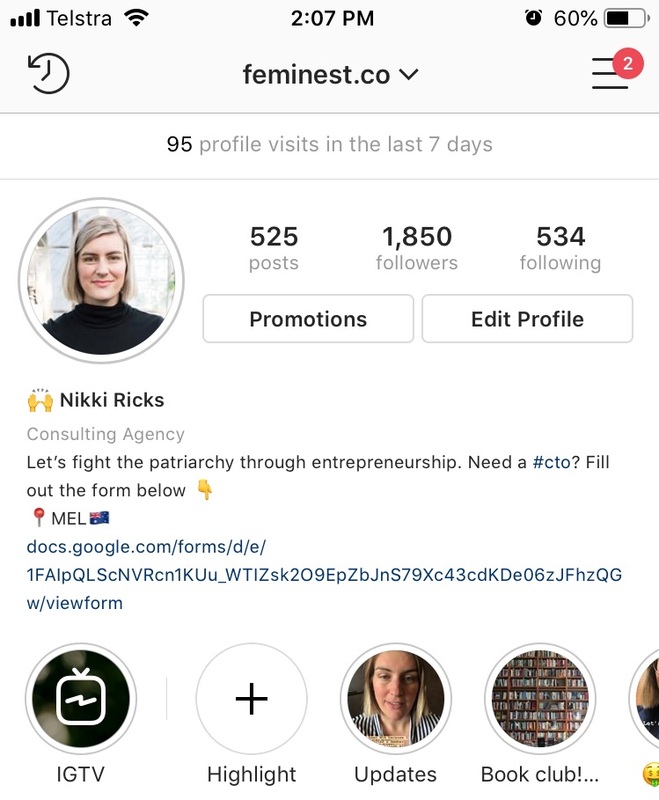 When the Instagram Business account became available, I obsessively checked my analytics daily. I loved seeing what worked and what didn't. I've since slowed this down to monthly, but I still think it's super fun to see what people respond to and what they don't. As an end-of-the-year reflection, I thought we'd go through my past year of Instagram analytics. But for the sake of time, blog post length, and all things good, we won't review all possible 24 analytic combinations. Instead, we'll just stick to the "All" option (as opposed to choosing "Photos, Videos, Carousel Posts). Let's dive in! 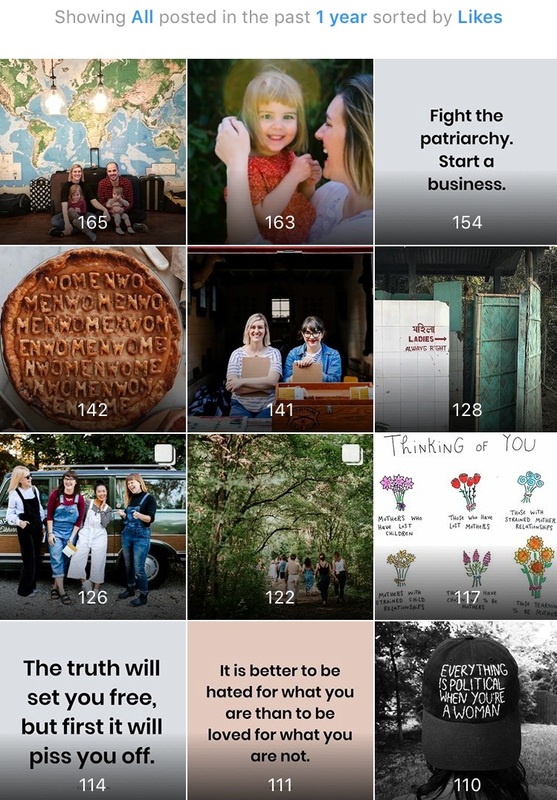 It wasn't all that surprising to me that my Top 5 posts from the year were pictures from Let's Camp 2017 — a lot of women came and tagged back to my account. That's just how the internet rolls. 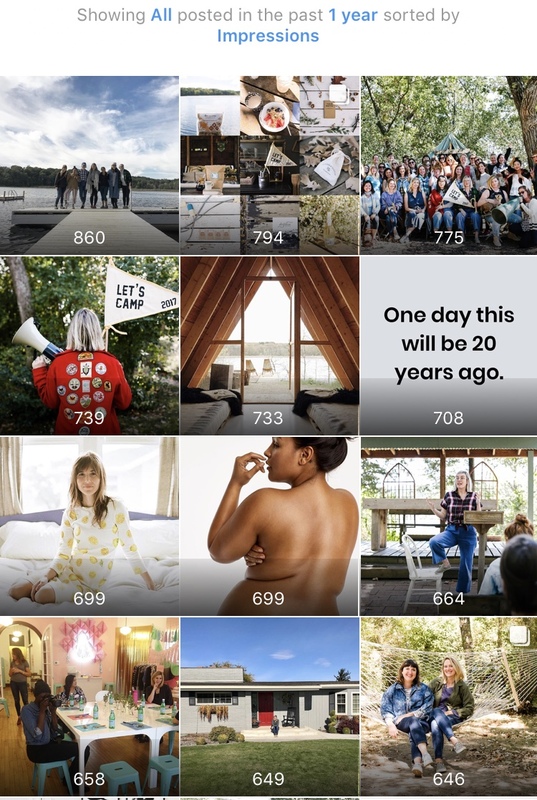 I love that the "One day this will be 20 years ago," quote post was the 6th highest. I'm not quite sure why, but it's a good quote. Whitney Lundeen from Sonnet James was tagged in this post, so I'm assuming that's why it earned so many impressions? Perhaps people were seeing it in her tagged photos. The gorgeous naked woman was a model from the Glossier #bodyhero campaign. She's so striking, and I think, more than anything, the post timing was in my favor. I posted the photo right after it came out. A second quote post pops up here: "You often get what you expect." Love it. So, again, the retreat photos rank highest here, but we do have a new contender: a group photo from one of my workshops. I don't typically use hashtags. (After shadow banning came out, I just lost interest in even trying.) But, I heavily hash-tagged this photo. Personal posts, like ones of my family, are always really high up there. This makes sense to me - I know that I like to see pictures of other people and their families, too. Travel. My trip to Costa Rica post received a pretty entertaining response from people. I wrote a quick and dirty reaction to my trip, and I actually had people text me to say they were sorry it went so poorly. It wasn't so bad (I actually enjoyed it)- I just wanted to be honest. It wasn't all sunshine and rainbows the entire time! New posts here, including this Tina Fey quote (which is so good). I have no idea why this post has more likes, yet it doesn't show up in any of the other categories. Also, this new post — I call it a "sandwich series" photo. For some reason, I have numerous pictures like this where I look like I'm describing a recent large sandwich I consumed and enjoyed. Here's where we get some variety — travel post takes the #1 #3, and #6 seat! Dinner pops up here! I host dinners every once in a while, and I was inviting people to attend my next one. Who whoa whoa WHOA - these analytics might be the most interesting. Some of the quotes I posted didn't really pop up anywhere else, but people apparently liked them enough to save them (just not enough to like or comment). I think a "save" is pretty flattering - people want to go back to it, to be reminded of it. The quote posts make sense for this. Event announcements make sense for a save, too - so people can come back to remind themselves they want to attend. Also, my video recommending an email app. And, of course, an amazing cross stitch. That makes sense. The retreat was a hit. Don't worry - we'll do it again! I need to work on my post timing, like the Glossier #bodyhero campaign. What's working for you in your analytics? Anything that surprises you? Would love to hear!